How did a group of formerly incarcerated people develop the power and capacity to lead an effort that made Contra Costa County the only county in California to reject a proposed jail expansion? 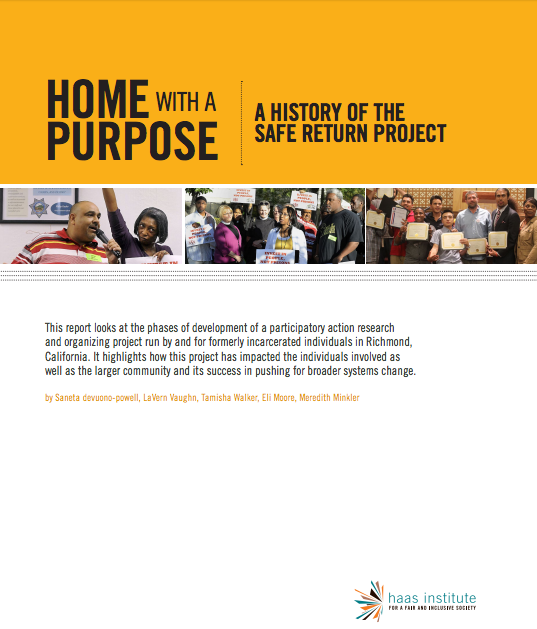 This report answers that and other questions by analyzing the formation, development and impact of the Safe Return Project. The Safe Return Project is comprised of Richmond residents who are working to study and address the needs of the formerly incarcerated. The goal of Safe Return is to identify strategies that respond to community needs, while developing the capacity for the formerly incarcerated to take the lead on the issues that impact them. Since the program started, it has hired formerly incarcerated people to engage in participatory action research (PAR), community organizing, and policy advocacy on issues impacting individuals coming home from jail and prison. The work of the Safe Return team has not only transformed the lives of many individuals, but it has also impacted the broader community in Richmond, as well as the national narrative around incarceration and reentry. This report offers an in-depth analysis of the Project, including challenges, successes, and key lessons from the organization's work in Richmond. Survey questions and prompts used by Safe Return to gather data on the experiences and insights of people coming home from incarceration. Five tools used by the Safe Return Project, including 1. The Check-list for community researchers carrying out survey interviews, 2. Consent form used to get permission to conduct a survey interview of someone, 3. Job applicant interview questions used to screen applicants to the Safe Return Community Researcher position, 4. The goals and principles behind the relational interviews that Safe Return carried out to build their community network, and 5. The evaluation form used to document relational interviews. Presentation slides covering all data gathered through the Safe Return survey. The report on key research findings and recommendations published by Safe Return in July, 2011. A report on employment issues facing people returning from incarceration, and recommended solutions. A report on housing issues facing people returning from incarceration, and recommended solutions. A report published by Safe Return and CCISCO on the key strategies and lessons learned during the successful campaign to prevent a jail expansions and invest in reentry resources, “Invest in People, Not Prisons”. A list of media articles covering the work of the Safe Return Project, and select clippings.